PADI, diving and Instructor Development (IDC) around Thailand: Successfull December PADI IE! 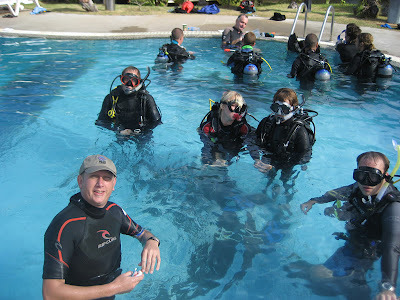 The December PADI IE has been successfully completed! Will, Sophia, Rob and Joakim have one thing in common today, they're no longer PADI Divemasters but as of today, they're PADI Instructors! Congrats! This morning they completed the last part of the PADI IE, their Confined Water presentation and their skill circuit. Later on today we will take the ferry back over to Samui and have a nice party and buffet at Aux Amis and than move on to Chaweng to celebrate their new status. Starting Saturday, we will continue with Instructor Specialties and after that Joakim's EFRI course. Time to relax a bit after yesterday's presentations, the Knowledge Development and Open Water presentations. Paul, myself, Sophia, Will and Rob having a break. This morning in the pool, Thomas, their PADI examiner, Rob, Sophia and Will with another IE candidate in their group. Joakim was underwater being a Certified Assistant. Here it is, the big sign of relief group picture of brand new PADI Instructors. From left to right; Paul who completed his IDCS, Sophia, Will, Rob, Joakim, Camille and Thomas the PADI Examiner. Unfortunately Miro who also completed his IDCS just like Paul had to leave early to catch a plane back to Sweden, so he's not in the picture.